Key findings: The painting was extended at an early point by the addition of a third board. This unusual memorial portrait appears to have been painted for Sir Henry Unton’s widow as a perpetual reminder of his achievements. The painting was recorded in her will, having remarried she was then Dorothy Shirley, dated 18 July 1634, in which she bequeathed it to her niece. It then reappeared in December 1743 or 1744 in the sale of ‘A Collection of Paintings belonging to a gentleman deceased’ and was purchased by Algernon Seymour, Lord Hertford, later Duke of Somerset. At his death the painting was sold to a ‘Mr Reade’, from whom it passed into the hand of James West. At the West sale in 1773 it was purchased by the printseller John Thane and then resurfaced in the attic of the house of Thomas Clater of Whitehead Grove, Chelsea in 1847. By 1866 it was owned by Henry Nugent Banks and was sold at his sale at Christie’s 24 November 1883. It was purchased by the Gallery in 1884. 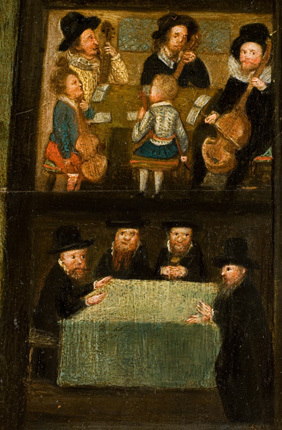 The construction of the support suggests that the painting may have been extended at an early point; the panel is made from two horizontally joined boards, which are possibly walnut, with a third, narrow board, which is possibly oak, attached along the bottom edge. It was not possible to sample the panel in order to confirm the wood types used. The x-ray also reveals pegs or dowels along the edge of the upper two boards, with three further pegs or dowels in the lower board; these suggest that the painting may have been originally secured into some form of panelling. 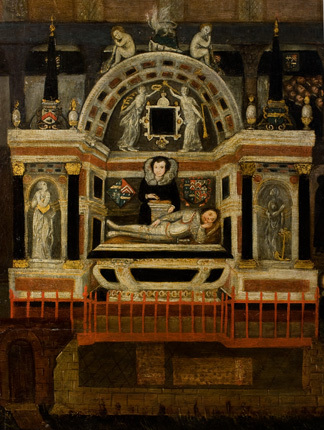 As Sir Henry Unton’s stone tomb was only completed in 1606, it is possible that the painting originally formed part of temporary memorial, which was then detached from a structure and turned into the portable painting that is recorded in his wife’s will. Strong suggested that the meticulous rendering of the coats of arms implies that the picture may well be the work of a herald (Strong, 1965, p. 54). This remains possible, and although the artist is competent, the painting style is characteristic of a painter who may have primarily worked on decorative projects. The handling is also characteristically English, and as a section was added at a later date the painting as it appears today is the work of at least two artists. The paint handling on the bottom board differs slightly from the main painting style. The paint in this area has a more fluid appearance with pronounced drying cracks and details are handled in a simpler manner. However, although the technique differs slightly, the paint craquelure indicates that the bottom board was applied only a short time after the main painting was finished. The paint down the right and left edges is damaged and has been covered with restoration. There is a clear line down each edge where the paint appears less dense in x-ray and numerous old paint losses can be seen. This may indicate that a framework of some form was applied after the first layers of paint were applied, but before the painting was completed. The technique and materials in use are entirely consistent with a work from this period. 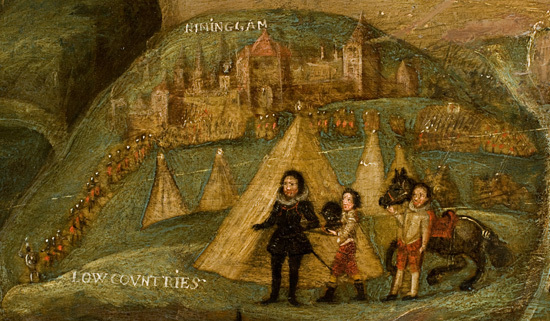 The provenance suggests that the painting was commissioned just after Unton’s death in 1596, and this is confirmed by the date of the costume. There is no obvious underdrawing but reserves were left for the parts of the design. The blue underlayer for the green landscape areas was carefully applied round the reserves left for major features of the composition, such as the church, the large figure of Unton, the mourners in black in the funeral procession, the figure with banners reclining next to the tomb, the roof and chimneys on the house. The noticeable low ridge around the edges of the reserves was formed by outlining the reserves before filling in the rest of the blue underlayer. Micro 03. 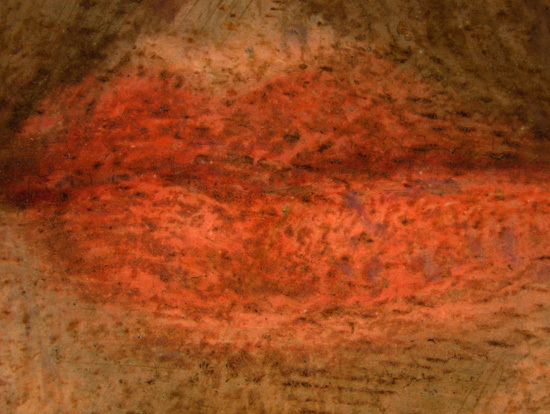 Detail of the lips (7.1 x mag). Micro 25. Detail of the sun (7.1 x mag). Micro 26. 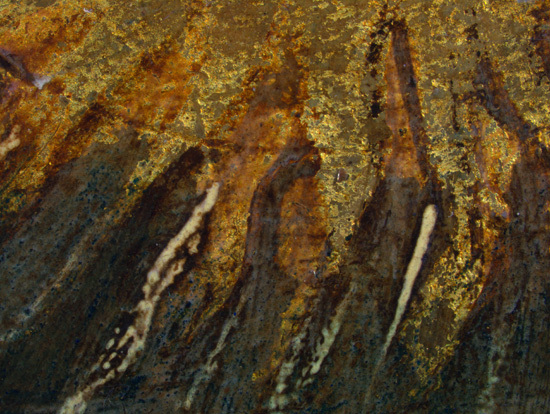 Detail of a tree (7.1 x mag). Detail 16. Detail image of the tomb. Detail 17. Detail of the cameo. Compare high-resolution images against the painting - mainly x-ray and infra-red photography images, but sometimes UV or raking light images - side by side with the ability to zoom in on details. The panel has a concave warp and a slight twist which is most likely to be due to stresses caused by the cradle which has been attached to the back of the panel. There is a long repaired split in the upper board running from the left through the church roof. At the top left there is a short repaired split running in from the left edge which has opened a little and some of the filling material is loose. Several campaigns of retouching are evident, mostly applied over the varnish layers. Outlines have been strengthened and thin glazes applied in local areas. With ultra violet light it can be seen that the restoration varies in tone, from darkest most recent restoration to the lighter areas of older restoration (See Ultra violet). Another layer of varnish was probably applied each time some restoration was carried out. The varnish layers are discoloured and yellowed. There is a cradle on the back with thirteen horizontal members and eight vertical members; the members do not slide. There is a cradle maker's name impressed into the lower end of one of the central vertical members: 'FRA LEEDHAM'. Prior to cradling the panel was thinned, which exposed worm channels, especially in the central board. The panel has a concave warp and slight twist, mostly likely to be caused by stresses due to the presence of the cradle. There is a long repaired split in the upper board running in from the left side across the church roof to the central figure. The top left edge has a shorter repaired split running through the moon, which is slightly open and some of the filling material seems a little unstable. There is a short repaired split at the right edge below the sun. There are wooden repair insets, triangular shaped, at the edges at the top of the joins on the right side and on the left edge at the top of the upper join. The paint surface at the left and right edges has been built up with filling and overpaint. The damage ends in a straight line down each side which suggests that these edges were set into a framework at some point. There are four round holes spaced evenly down the left and right edges, which can be seen clearly in x-ray (see X-ray). There are also three round filled holes in the bottom strip of wood, but these are unevenly spaced, with two towards the right and one towards the left. The holes are plugged with wood which might be the remains of dowels. This suggests that at one time the panel might have been attached to framework or wainscot panelling. There are thin wood fillets round each edge. An examination of tree rings, which can help to provide the earliest possible felling dates for the wood used for the panel. The technique can also indicate the geographical origin of the wood. The wood could not be identified and was therefore unsuitable for analysis with dendrochronology. A technique used to identify changes in composition beneath the surface of the paint layers and to understand the physical structure of a panel or canvas. The wood grain in the three boards is very clear in x-ray (see x-ray mosaic 01). The upper two boards have the same wood grain and this can be compared with the portrait of Sir Nicholas Bacon NPG 164, where the wood has been identified as walnut. The lowest and narrowest board has a different wood grain which appears to be oak. In the upper two boards there are round holes at the right and left edges which are filled with wood dowels, or plugs. There are round filled holes in the lower board, one in the centre of the lower part of it, another in the upper part towards the right and another in the upper part towards the left. These may relate to the original framing or support method. The side edges have evidently been covered by a framework. There is a clear line down each edge where the paint appears less dense in x-ray and numerous old paint losses can be seen. X-ray revealed the word 'ANGLIE' on the right edge, below the window in the birth scene. This is not otherwise visible because the damaged edges are covered with restoration. 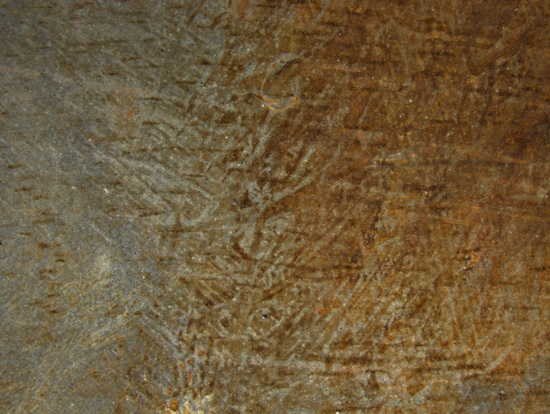 The paint surface beyond the damaged edges appears dense in x-ray which might indicate that the framework was applied after the first layers of paint were applied, but before the painting was completed. Cracks and repairs can be seen, and in some parts there are worm holes. The joins have been rejoined and repaired. Triangular wooden inset repairs can be seen at the edges, at the top of the joins on the right edge and at the top of the upper join on the left edge. Worm holes can be seen in some parts of the panel. The green landscape areas and the sky are noticeably dense in x-ray, and evidently contain lead-based pigment. It is clear that the blue underlayer for the green was applied carefully round the edges of reserves left for some of the major features, such as the church, the mourners in black in the funeral procession, the figure with banners reclining next to the tomb, the roof and chimneys on the house, and the large figure of Unton. The blue underlayer for the green paint formed a low ridge round the edges of the reserves when it was applied. There are several changes in composition. The lower part of the sleeve hanging from the right side shoulder has been shortened, and the head of a woman was painted into the space and green painted round it. The body of this figure, and also the other figures seated beneath the plaques, were painted over the green landscape paint. The white shield shapes, hanging from the trees above these figures, were made a little wider. In x-ray there are four dense vertical elements, which might have been intended as a window or a row of columns, which can be seen in the left part of the house where four figures sit around a table with a green cloth; the four figures round the table were painted over these four vertical elements. The paint layers on the lowest board are less dense in x-ray. The wood grain is more prominent and the green landscape paint mixture, which is used extensively on the upper two board is not present on the narrow lowest board. A technique used to observe the layers beneath the paint surface which can reveal underdrawing and changes to the initial design. No underdrawing was visible using infrared reflectography (see DIRR 01). Areas of restoration can be seen at the right and left edges, and in the church roof. Changes in the composition can also be seen using infrared reflectography: in the room with four figures sitting at a table, four verticle elements (possibly a row of pillars) are evident beneath the final paint surface; the increase in the size of the white shield shapes is shown; eight black birds can be seen above the trees when only one can be seen in the final paint surface, whilst there are at least sixteen black birds visible in the trees compared to only five visible in the final paint surface; a figure on horseback can be seen on the hill above the city of Nijmegen, which is not visible in the final paint surface. Infrared reflectography reveals that a square of gold leaf was applied in diamond shape when gilding each of the rounded knobs on the uprights of Unton's chair back. The rounded shape of the knobs were made by painting over the corners of the gold leaf. The paint surface on the lowest board has a very different appearance to the paint surface above, where the paint appears lighter and considerably more dense. The procession of black mourners and figures carrying the coffin appear in sharp contrast in infrared reflectography against the green table cloth beneath Unton, whereas in normal light they appear less clearly defined and merge into dark tablecloth. Investigation into microscopic pigment samples or samples of other media in order to help with dating, to reveal the order of the paint layers and help to understand the painting techniques used. A thin pale buff layer is visible in Sample 4 beneath the grey priming but not in the other samples. The grey priming is composed of plant/charcoal black, lead white and occasional red ochre particles. It is possible that the lowest layer is missing from the other samples and that a variable tone of grey priming was applied. 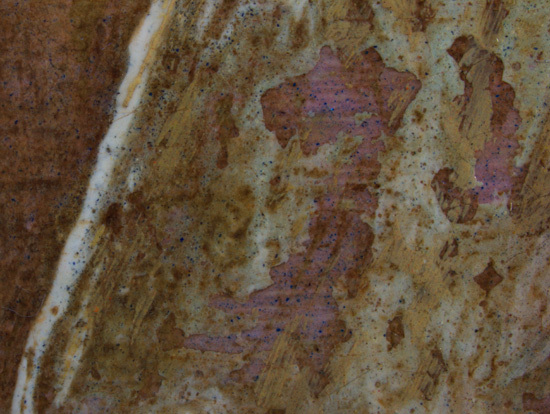 Sample 5: Dispersion from Unton's black coat shows that the black is lamp black with what appears to be a yellowish lake. Sample 8: Dispersion from the leg of a black child in the Masque scene shows larger angular particles and is probably plant black such as vine or fruit-stone black. 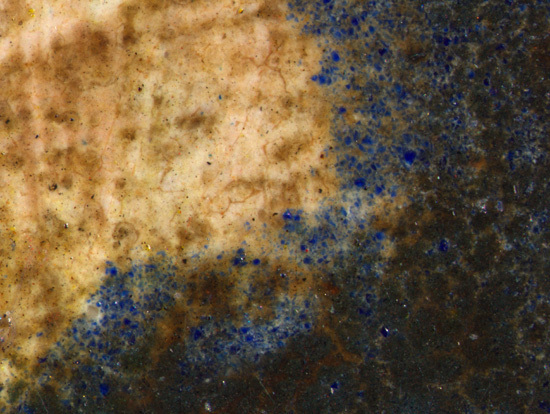 Sample 7: Dispersion shows azurite and indigo. The main body of the man was painted with azurite, with the dark lines painted with indigo. Sample 4: Cross-section shows a thin buff coloured layer, the grey priming, the copper green of Unton's tablecloth, the thick vermilion underlayer for the coat of arms, and a substantial layer of red lake, which appears in ultra violet examination to be madder; the gilding lies directly over the red lake with no other mordant. Sample 9: Cross-section from the lowest board. The lowest layer is a dark grey, which is the same grey as in other samples but darker. 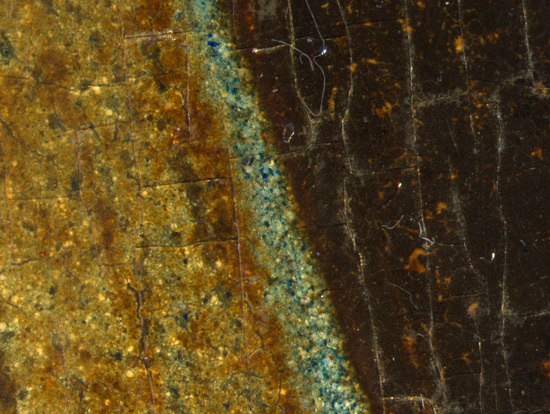 A translucent copper green layer (perhaps with some black) lies over the grey layer. A solid red mixture of vermilion and lead white lies over the green, with a bright lead-tin yellow over the red. 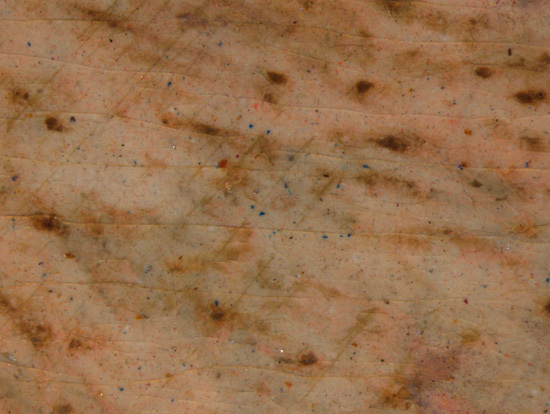 Traces of a modifying layer of brown oil paint can be seen over the yellow. An examination of the construction of paint layers, glazes and condition often using a microscope. This method provides important evidence concerning an artist’s technique and paint handling and can reveal a specific artist’s characteristic painting style. The paint handling along the bottom board differs slightly from the main painting style. The paint in this area has a more fluid appearance with pronounced drying cracks, and details are handled in a simpler manner (see micro 11 and micro 21). Although the technique differs slightly, the preparation layers and the paint craquelure indicate that it was applied a short time after the main painting was finished. The grey priming acts as a cool grey underlayer for the flesh and has been allowed to show through in some areas. The flesh has been built up in fine linear brushstrokes following the contours and features of the face; the texture of the brushstrokes is emphasised by old varnish residues. The flesh paint contains lead white mixed with a finely ground red pigment, likely to be vermilion, azurite, red lake and black (see micro 04). Around the nose there are short brushstrokes of red paint applied like hatching and blended into the surrounding flesh paint for shadows. The buff ground and grey priming layers are visible around the pupils of the eyes (see micro 01). The irises have been painted with a dark brown paint mixture containing earth pigments, black and a little lead white. The whites of the eyes have been painted up and around the irises, loosely laid in allowing the grey underlayer to show through. A highlight of lead white has been added while the paint of the iris was still wet, creating some blending of the paint layers. The corners of the eyes have been marked in with a daub of pink paint containing vermilion mixed with lead white and red lake. 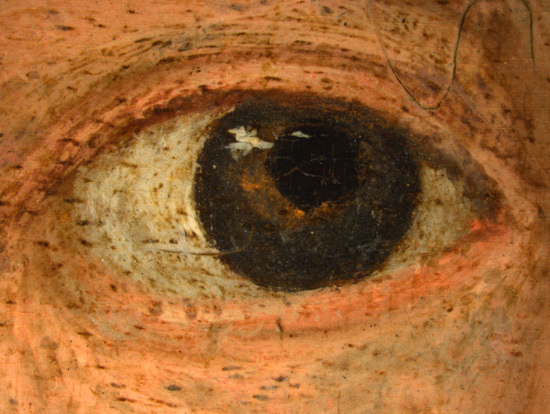 The upper eyelid has been defined with a stroke of reddish brown paint. The lips have been painted with fine, linear brushstrokes creating the shape of the mouth. The paint contains vermilion mixed with lead white and the lower lip has a higher content of lead white to show the light falling on it (see micro 03). The parting of the lips has been marked with a line of red lake glaze. The medium-rich glaze has a different craquelure pattern to the surrounding paint layers. A reserve has been left in the green curtain for the basic area of the hair. A translucent brown paint layer has been used to block in this area. The final paint layer of the hair has been painted in after the curtain, flesh and costume were completed. Grey and brown paint have been blended together and applied in loose strokes to create the form and texture of the hair. The moustache and beard are both painted using shades of thin, pale brown paint applied in linear brushstrokes with a fine brush. The fine brushstrokes have been built up to create the form and shape of the facial hair. The beard and moustache were painted when the flesh and ruff paint were still wet creating wet-in-wet blending in these areas (see micro 05). The shape of the ruff has been loosely blocked in with a thin layer of pale grey. The edge of the ruff has been painted in white, this is painted over the grey underlayer and extends over onto the background and costume to indicate the translucent, fine material used for the ruff. Broad brushstrokes of grey have then been laid in to define the folds in the fabric. A dark grey underlayer has been applied to mark out the costume over which a dark translucent layer of black has been painted. The gold thread details are painted with a mixture of lead-tin yellow and white. An orange pigment has also been used which has beaded on the surface of the underlayers. The dark grey underlayer of the costume has also been used for the cameo over which a warm layer of brown and the darker layer of black paint have been applied (see detail 17). 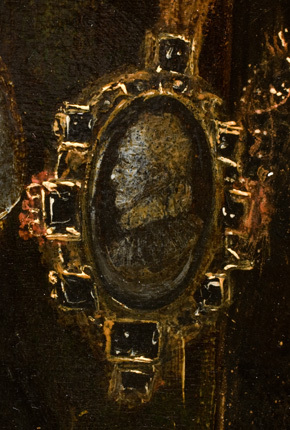 The face on the cameo has been painted with very fine brushstrokes. The gold setting for the jewel is painted in a mustard yellow composed of earth pigments mixed with lead white. The black jewels have been painted in dense, translucent black which was still wet when the highlights were added, creating wet-in-wet blending. The main areas of shadow and highlight in the fabric have been marked out. The shadows are depicted in a dark reddish brown and the highlights have been applied with a paint mix containing azurite, yellow pigment and a little red lake. A copper green glaze has then been applied to the whole area. 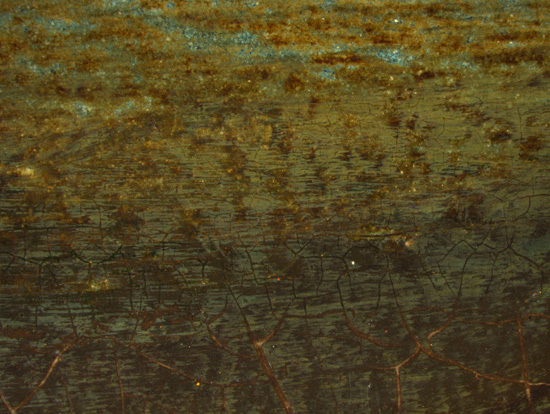 A raised ridge of paint can be seen in areas where the dark part of the figures meet areas of green grass or sky (see micro 14). This has been caused by the application of a thick layer of azurite mixed with lead white which has been applied to many areas of the background scenes with reserves left for figures and architectural elements. Where the paint is thickest it would appear the artist has carefully painted the outlines before filling in the marked area. This paint mixture has also been used for the floor beneath the banqueting table of the masque scene, between the sitter’s legs. In raking light it also helps to identify a pentiment in the scene in the house below the musicians. This space was originally planned as a window or row of columns. The azurite paint mixture has been applied as four vertical strips which has then been painted over with figures (see detail 21). For areas of landscape which appear green in the final composition a layer of yellow pigment mixed with white has been thinly applied over the azurite layer. The trees have been painted in three layers: an initial bright blue paint containing azurite has been laid in with a layer of yellow applied in short brushstrokes over it (see micro 26), and then the final highlights defining the small leaves have been added in a thick bodied paint containing yellow pigment particles and lead white. 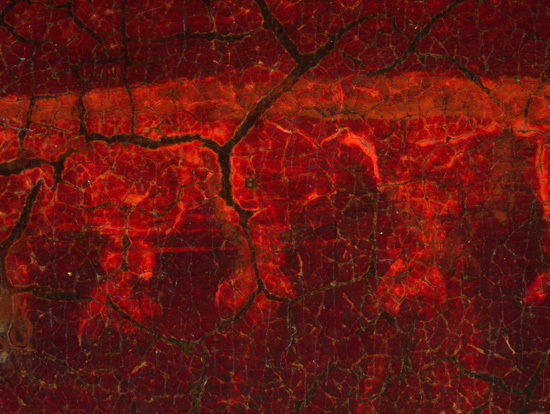 Areas of red paint in the background scenes have very pronounced drying cracks compared to other elements of the composition (see micro 17). Across the painting certain elements of the composition and fine details have been gilded. In all areas there appears to be a pale buff mordant layer onto which the gold leaf has been applied (see micro 13). This technique has been used for tiny details such as the rider’s horn in the background and the heraldic beasts on the shields and coats of arms. The decorative knobs on the top of Unton's chair have also been gilded. Using infrared reflectography the square shape of a sheet of gold leaf can clearly be seen (see Infrared reflectography). The gold leaf has been laid in place and the surrounding curtain and chair have been painted over the unwanted areas of gold. The sky around the moon is a mixture of lead white mixed with blue, possibly smalt (see micro 22). 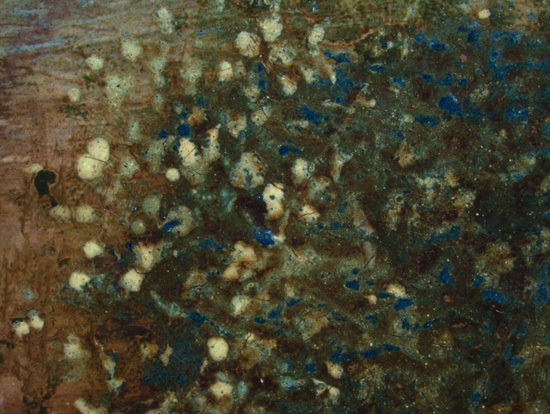 A darker glaze has been applied over the blue which has dried in small islands of paint. It is dark brown in appearance but possibly contains a faded red pigment. The sky around the sun has a purple tone. In an area of loss in one of the mountains a brighter pink paint can be seen which is likely to have been the original colour and contains red lake mixed with a blue pigment, possibly smalt (see micro 27). The green of the distant hills beneath the moon have been made with a mix of blue and yellow pigment to make green. The clouds around the figure of Fame have been painted after the main figure and contain a small amount of azurite. The moon has been painted in a warm white paint applied over the top of the brilliant blue of the sky. The sun has also been painted over the top of the azurite paint mixture used for the sky in this half of the painting. An incised line has been used to mark the circle for the shape of the sun (see micro 25). A pale buff mordant layer has been laid in and gold leaf has been applied on top. The details of the sun's face has been painted in a warm, translucent brown paint. The rays of the sun which extend into the scenes of Unton's life are painted in lead-tin yellow. 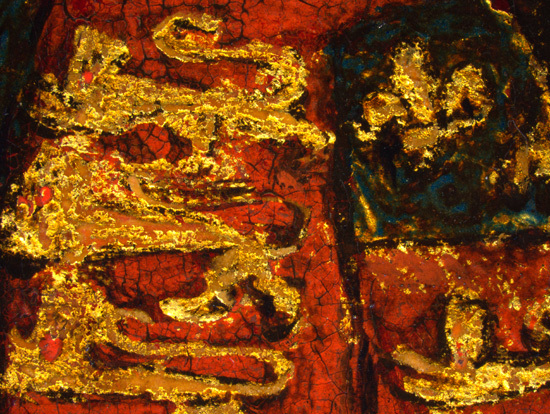 The plaques in the centre of the painting are painted in a thick lead white paint with black outlines (see micro 24). They were originally planned to be slightly smaller than they now appear. The original black lines marking the outline can be seen beneath the white paint. 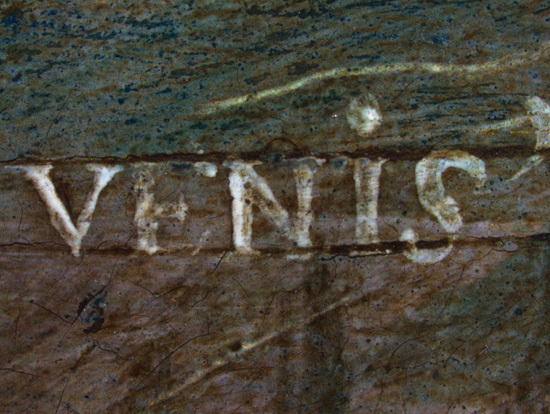 Incised lines have been marked in to indicate where the text will be written. The lettering is painted in a translucent black paint which has become worn and abraded over time. The locations shown in the scenes of Unton’s life are identified with written inscriptions. 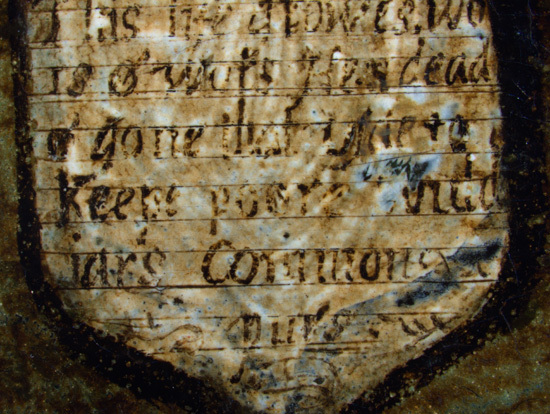 Some of the inscriptions have incised lines marking where the lettering will be placed (see micro 23). The letters are painted in a thick lead white paint. The roof of the church has been outlined in the raised azurite and lead white paint mixture used for green areas of the background. No reserve has been left for the spire, which is painted over the blue underlayer. The church is painted very simply in a thin paint layer composed of varying proportions of earth pigments, lead white and black. The fine lines of the lattice windows have become very worn. A reserve has been left for the main shape of the tomb but the decorative elements on the top have been painted over the paint layers of the church (see detail 16). The white marble of the tomb is painted in lead white mixed with a little black with grey for areas of shadow. An opaque red has been used for the red marble. Many areas of the tomb have gilding applied on top of a pale mordant. The red railing around the tomb has been strengthened but an bright opaque red can be seen beneath this layer. The plaques with text have been enlarged during the painting stage. There are black birds in the trees around the plaques, and in infrared it is apparent that many more birds were originally included but they have been painted out in the final composition. A figure on horseback on the hill above the city of Nijmegen has also been painted out (see Infrared reflectography). The room beneath the musicians was originally planned to have a window or colonnade but has been altered to a room with figures seated at a table. Along the two sides of the panel there is significant retouching. The original paint layers in these areas are thinly painted and very damaged which may indicate they were never fully finished as they were planned to be under framing. A scratch running diagonally across the roof has been retouched. There are numerous other areas of retouching scattered across the painting, mainly to cover small areas of loss or abrasion. 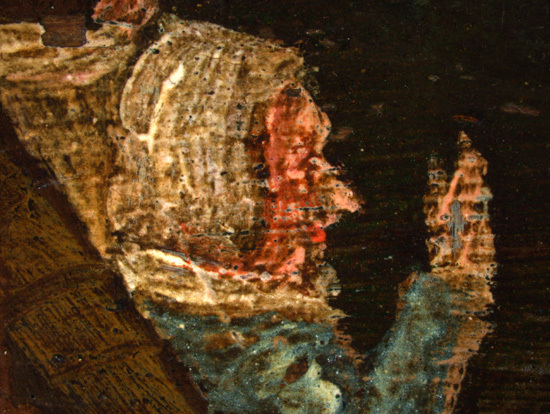 A method which helps to reveal past restoration and the extent of varnish layers. Old varnish layers can be seen over most of the paint surface; these fluoresce pale and opaque in ultra violet light (see UV 01). The layers are uneven and it is evident that they have been disturbed and thinned selectively. It is clear that there have been several campaigns of selective cleaning and selective restoration. There are numerous areas of restoration and strengthening of detail, applied mostly over old varnish layers. These appear dark in ultra violet light but the tone varies, and the most recent restoration has the darkest tone. The long restored crack across the church roof appears very dark. The tablecloth in front of the portrait of Unton appears very dark and heavily restored. There is a large dark area in the crowd in the church and this seems to be due to removal of the old opaque varnish in this area.